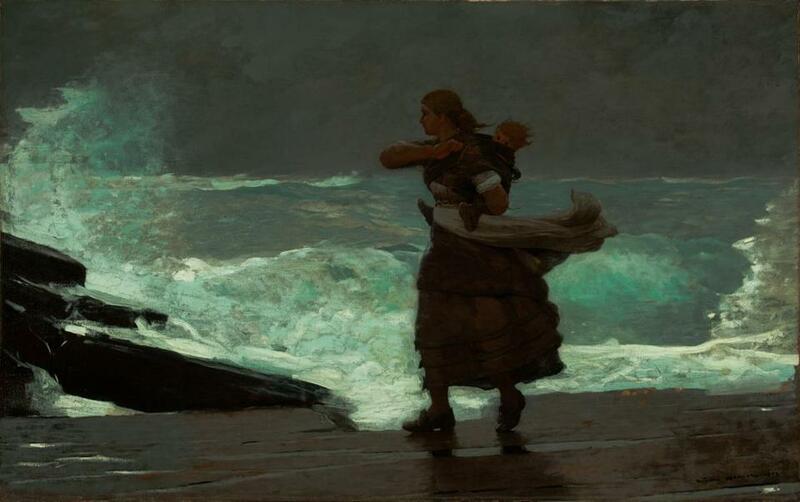 “The Gale” is one of 50 works by Winslow Homer in “Coming Away: Winslow Homer and England,” at the Worcester Art Museum. WORCESTER — In 1881, Winslow Homer fled to England. Or perhaps he was drawn there. He was famously close-mouthed, and we don’t know his motives. We do know what happened to his art there — something that looks alchemical. Urgency, drama, and atmosphere intensified. It wasn’t alchemy, of course. It was attention, study, and practice. In 1843, in the first volume of “Modern Painters,” the British critic John Ruskin had advised painters to be true to nature, “bare, clear, downright statement of facts,” and higher truths would follow. Homer was on that trail. “Coming Away: Winslow Homer and England,” at the Worcester Art Museum through Feb. 4, examines what happened during the artist’s 19 months in England, and how the Northumbrian fishing village of Cullercoats resonated in his art until he died. It features 50 works by Homer, and more by English artists who influenced him. Homer was 45 when he went, and a successful artist. After getting his start illustrating the Civil War for Harper’s Magazine, he was working in New York and Gloucester, painting brisk, nostalgic leisure scenes. But he was restless. He practiced British watercolor techniques — transparent pigments, wet-on-wet application, blotting or scraping to reveal the paper below. He had looked at the British watercolors of Joseph Mallord William Turner and James Abbott McNeill Whistler, an American expatriate in London. He departed for England, and settled in Cullercoats. There he worked mostly in watercolor and drawing; many terrific works on paper are here. His technique grew more daring; his vision consolidated. Exhibition organizers Elizabeth Athens, assistant curator of American art at the museum, and Brandon Ruud, curator of American art at the Milwaukee Art Museum, offer many reasons. After Homer saw the Elgin Marbles, at the British Museum, his figures grew more sculptural; he purchased two cameras in London and his spatial dynamics grew more nimble and photographic. (In June, “Winslow Homer and the Camera: Photography and the Art of Painting” opens at the Bowdoin College Museum of Art.) He saw paintings such as Frank Holl’s “A Fisherman’s Home,” a sooty scene focused on a heroically backlit woman, and he began to paint women at work. All likely true. But it seems just as true that Homer, having reached his maturity as an artist, now found himself at the crux of several of picture-making’s great divides. Between line, which tells a story, and color, the stuff of composition and energy. Between figure, which we identify with, and seascape, which threatens and awes us. Between water’s evanescence and the solidity of land and flesh. Between who we are — in the person of his subject — and the marvel we gaze out upon. “Coming Away” hinges on two indomitable canvases. The first was finished in Cullercoats. “Hark! The Lark” depicts a trio of fisherwomen, ruddy against a sky soaked with light, pausing to listen. Homer thought this his finest painting. Although the pageantry of his seascapes is missing, these young women, their sleeves rolled up, engage for a moment with the sublime. What elevates them is offstage, fleet but penetrating. The painting makes a fascinating contrast to an earlier work, “The Cotton Pickers,” in which two black girls pause in a fluffy white field. It’s still romantic, but the colors are less transcendent, and it’s politically fraught. An American audience would be more willing to make English fisherwomen into lyrical standard-bearers for female labor. Homer may have begun the second painting in Cullercoats. It was big — about 3 feet by 4½ feet feet — and depicted a woman on a pier with a babe on her back, leaning into the wind toward a fishing boat and a small building. Originally titled “The Coming Away of the Gale,” it got mixed reviews when he showed it in New York. Always attentive to critics, the artist went at it again, cropping the image and painting it over, placing the woman and her infant on a dark beach, cranking up the tension between human and nature. He called it “The Gale.” The wind menacingly blows the woman’s apron; the sky is slate gray. The sea alone holds light, glowing with white foam and pale aqua where it rises at her feet. The first gallery of “Coming Away” anticipates Homer’s trip; the second establishes him in Cullercoats. The third, glorious gallery demonstrates where Cullercoats took him, again and again: to the voracious, unpredictable sea, and weather you feel the weight of. The heart-stopping “The Life Line” depicts a sea rescue via pulley. All is dashing water; the only thing we can cling to as a rescuer shuttles the sopping body of a woman over waves is the taut line they ride along. Often Homer abandons the figure entirely for the irresistible spectacle of the sea. Light from an unseen moon splashes on the water in “Moonlight, Wood Island Light.” The brushwork is as viscous and loose as melting butter. So often Homer’s images rely on something not seen. In his last oil painting, “Driftwood,” made in 1909, the year before he died, the violent crash and jump of water on rocks make you feel the cold and taste the salt. But in the foreground, a solitary lobsterman stands, blocked from the sea by a timber, his back to us as he watches. He might be a stand-in for Homer, witness to light and color, form and formlessness, confronting the greatest challenge in painting nature’s truth: its ineffability.